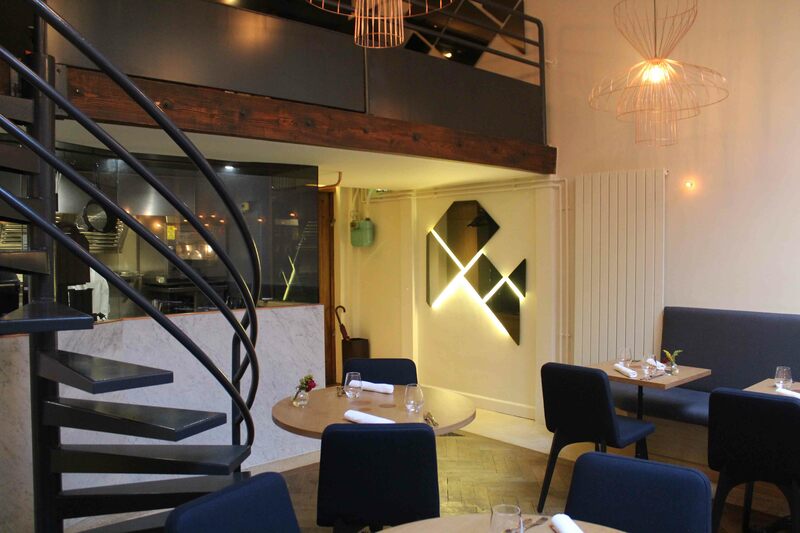 Newcomer on the bustling 10e dining scene, brought to us by world renowned chef Andre Chiang, with razor sharp cooking from Vincent Crepel in a modern luxury setting. 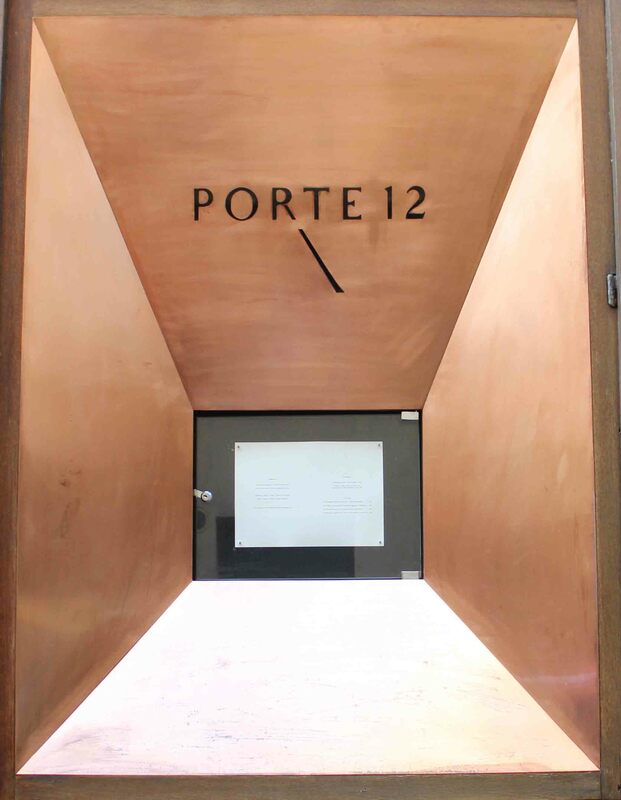 Porte 12 is about a 3 minute walk from métro Poissonnière. This area appears to be a growing hotspot for restaurants (high and low end). Not far from here, you’ll find the tiny French/Japanese spot Abri, hip all day dining, no reservation hangout Le Richer, veggie / vegan hangout Café Pinson and about a 10mins walk from Porte 12 is Bistro Bellet (that I’ve written about here) and a couple of doors down, the recently hyped restaurant / bar, 52 Faubourg St Denis, amongst others. 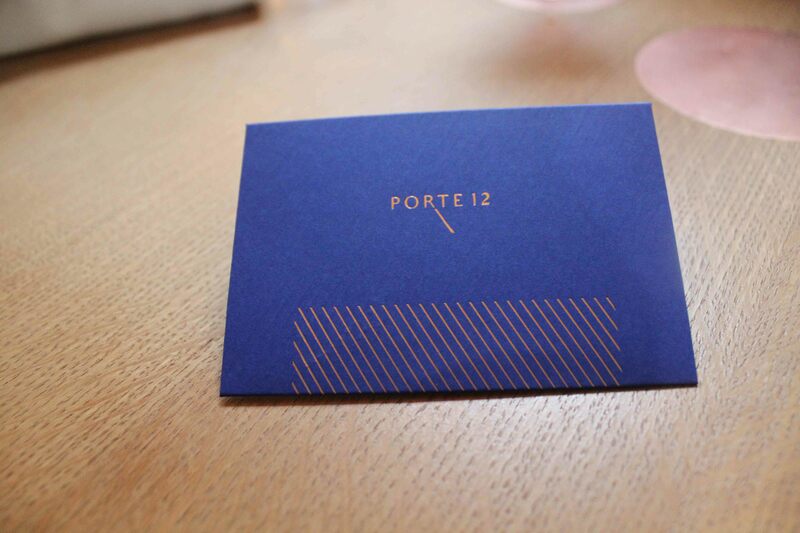 The design of Porte 12 has clearly being considered. Yves Klein blue and other blue hues alongside accents of copper. 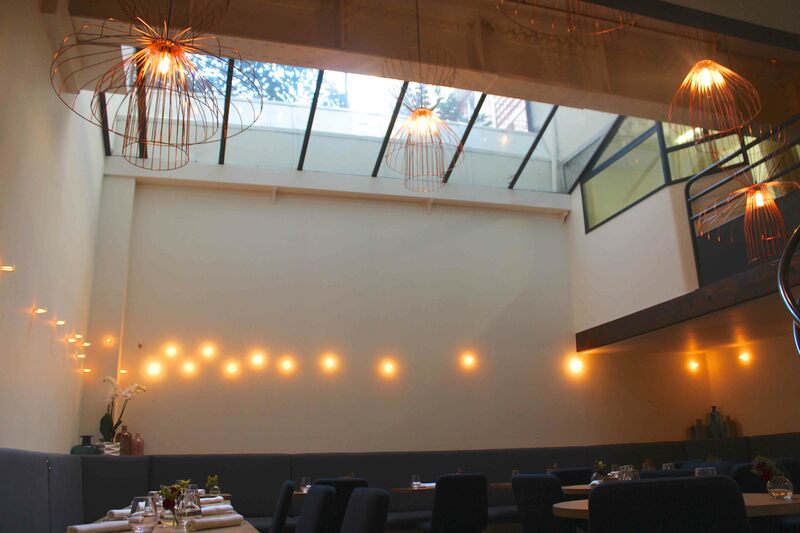 Right from the exterior as you peruse its menu, through the corridor, into the main room and even the washroom (which by the way is super cool with its cobbled floor). 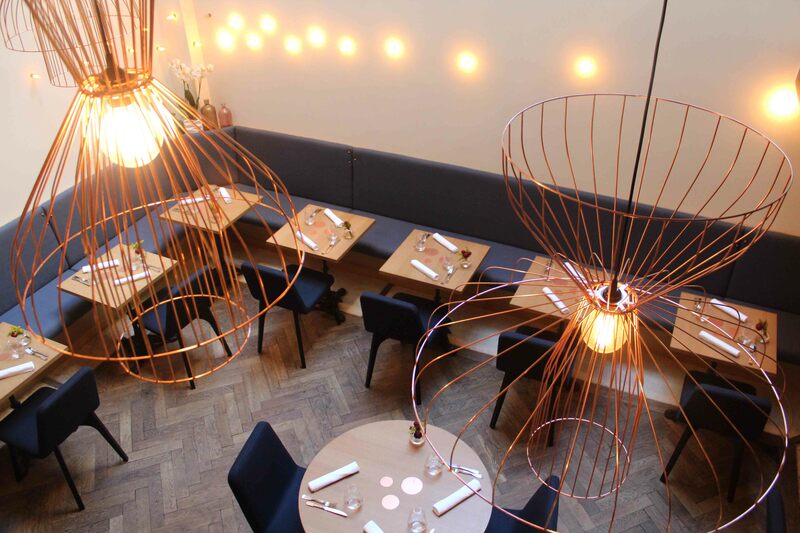 I also noticed copper pipes running on the interior of the glass wall that separates the dining room from the kitchen, the copper studs embedded into the padded backs of the dining sofa and the copper light hangings that act as the centre piece for the room. The space isn’t large, holding 32 or so people but during the day light pours in from the glass roof, so it feels quite bright and spacious. 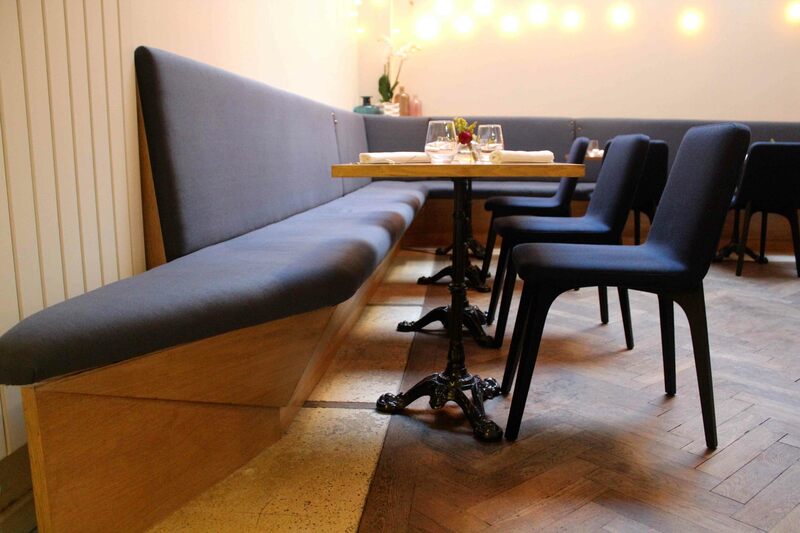 Simple wooden tables line the parquet flooring. 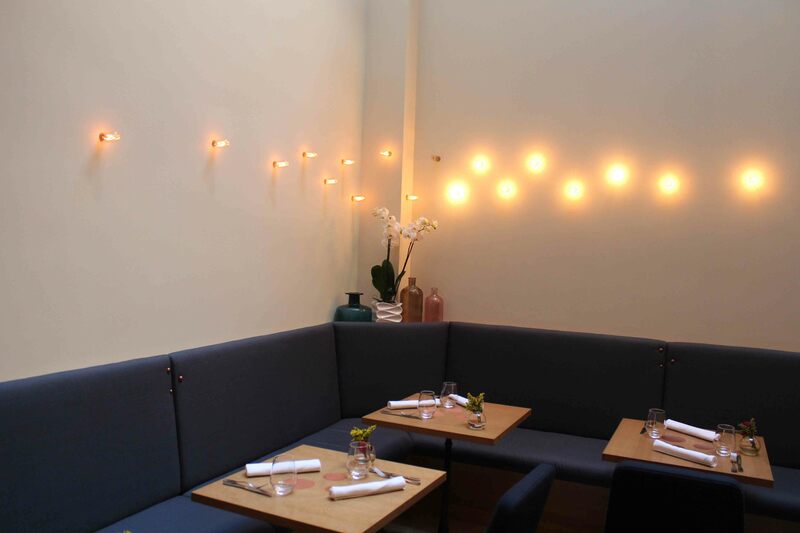 There are a couple of individual tables but the restaurant seating is made up predominantly of one long L shaped-esque blue sofa that is demarcated by the tables. 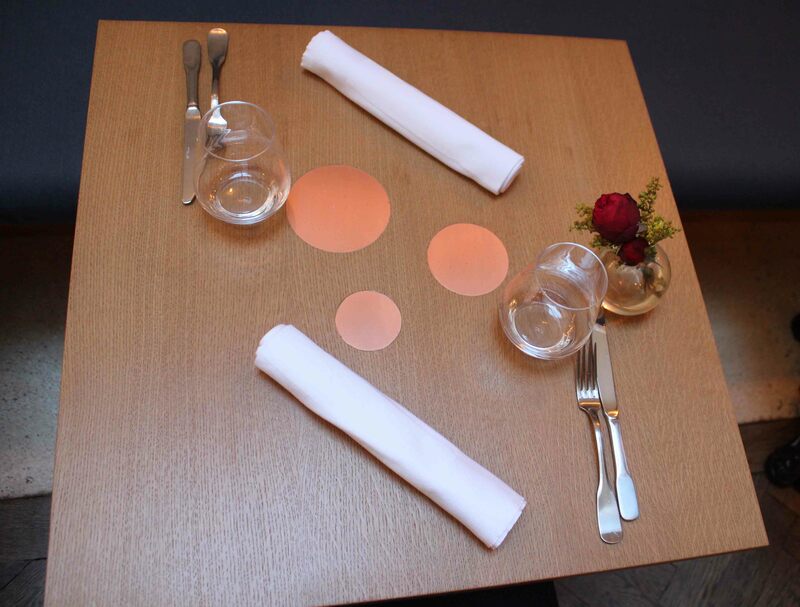 As I’m sure I’ve mentioned several times already, my pet peeve is little flower pots on tables – I just find them naff and redundant. 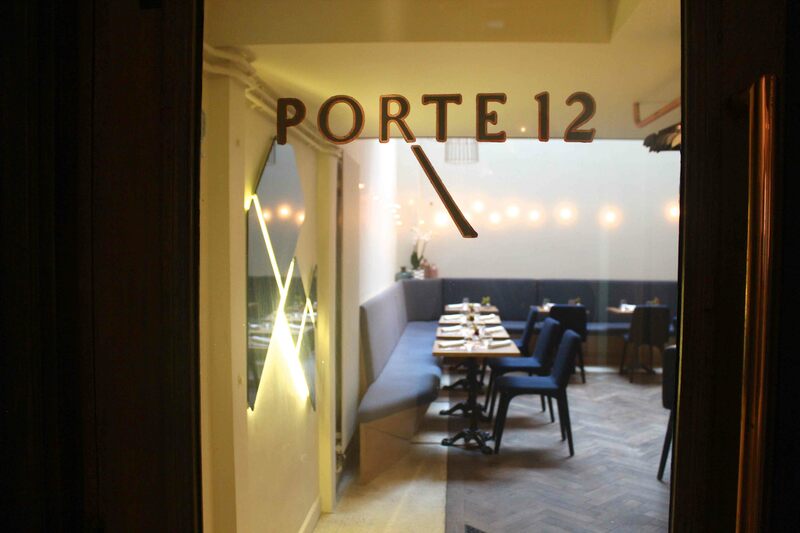 However, the ones at Porte 12 somehow didn’t offend me – perhaps it’s because it is in such a pared back space. We went for lunch. I think there were two choices per course. 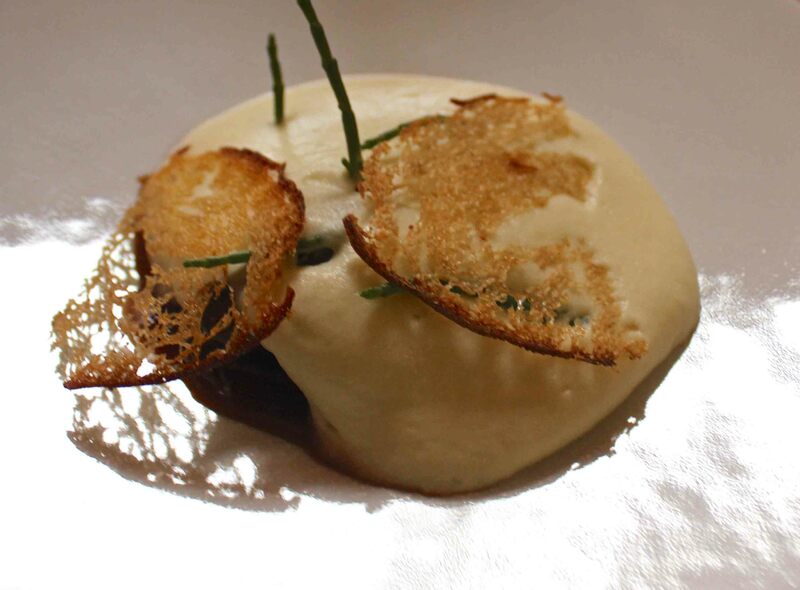 To start with I ordered the duck heart immersed in quite a thick onion jus, enveloped in the smoothest potato purée, with wispy crouton slices and samphire atop it. Duck is definitely one of my favourite things and Porte 12 did an absolutely stellar job in reaffirming this; no tug of war required on the plate as it was cooked beautifully and dissolved delicately in the mouth. I longed for this joyous moment to go on, so made my way through the dish in a rather miserly fashion. Could the next dish live up to this? Here we had strips of chicken breast on a bed of creamy fregola risotto, with marmalade egg yolks, a small crunchy nest of fermented and fried corn, corn purée and a vinegar reduction. The chicken was succulent and tender though I felt it could have done with a smidgen of salt. The sweetness that the three nodules of the marmalade yolk brought to the dish was perfectly measured. 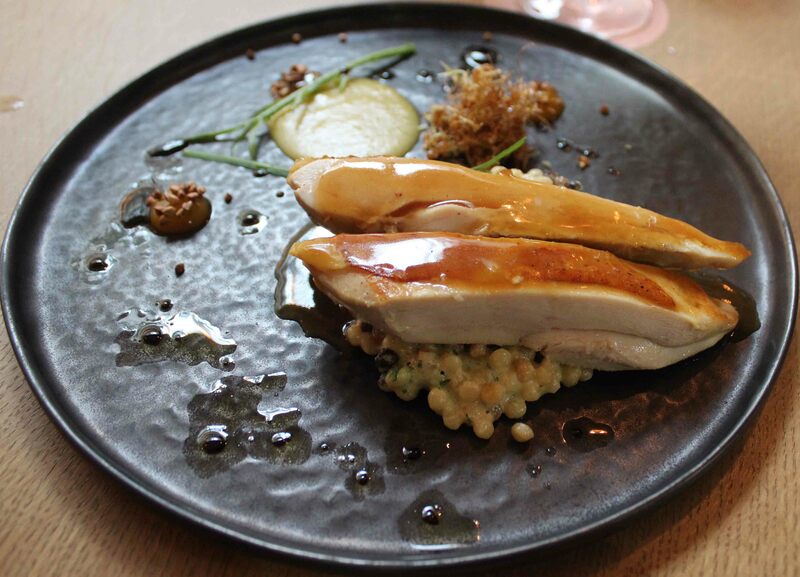 I absolutely adored the texture combination: when I brought together on a fork, the chicken layered on fregola, corn crunch and marmalade yolk, it all made perfect sense. So far, so very good. Then came the dessert. Chocolate ganache, brown butter ice cream on a chocolate crumble, chocolate liquor jelly pieces and little knobs of rice pudding cream flavoured with verbena. Would it be sacrilege to call it a gourmet kit kat? Probably but components wise, the two aren’t a million miles apart. Taste wise, obviously incomparable. 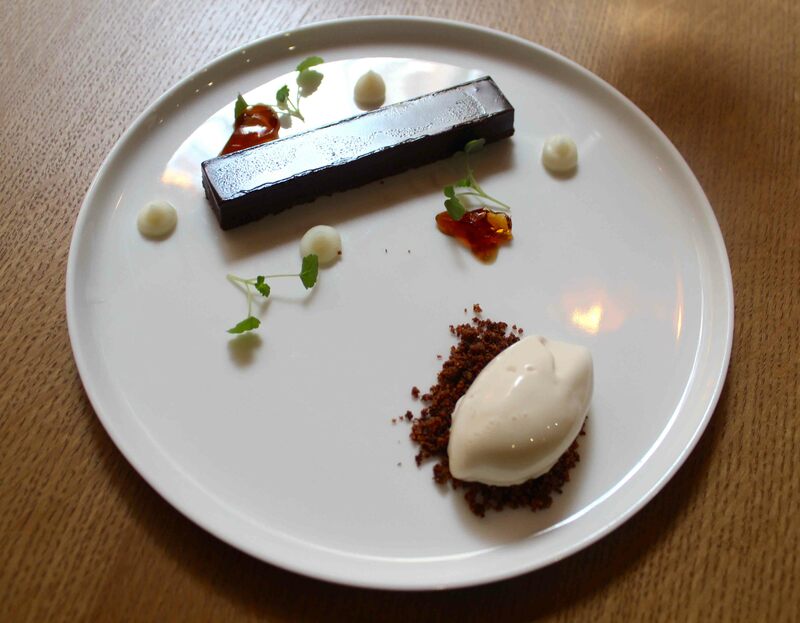 Absolutely loved the slight sharpness that punched through from the chocolate liquor jelly, juxtaposed wonderfully against the sweetness of velvety beurre noisette ice cream – flawless. I always profess my lack of knowledge on the wine front, so the restaurant director and sommelier, Thibault Passinge, came to my rescue (who as a side note is rather delightful); he offered the Argile blanc 2013 du Domaine des Ardoisière which was fooking ace! As mentioned, went during lunchtime, so it was mainly a business crowd but everyone looked super relaxed. It seemed like a mostly French clientele, so not yet over pouring with tourists like myself. I don’t travel as much as I’d love to. Still so many places on the bucket list! Yes exactly, Paris would be perfect for me. I was last there something like 15 years ago… It looks like you’re traveling quite a lot yourself. Cool. To go to Japan one day – that would be the dream! I hope you make it to Paris though – what a delight for a lover of sweets like yourself. Yes, it really was good value! Are you based in Paris? You should definitely check it out if so. OMG, it sounds like incredible value for money! 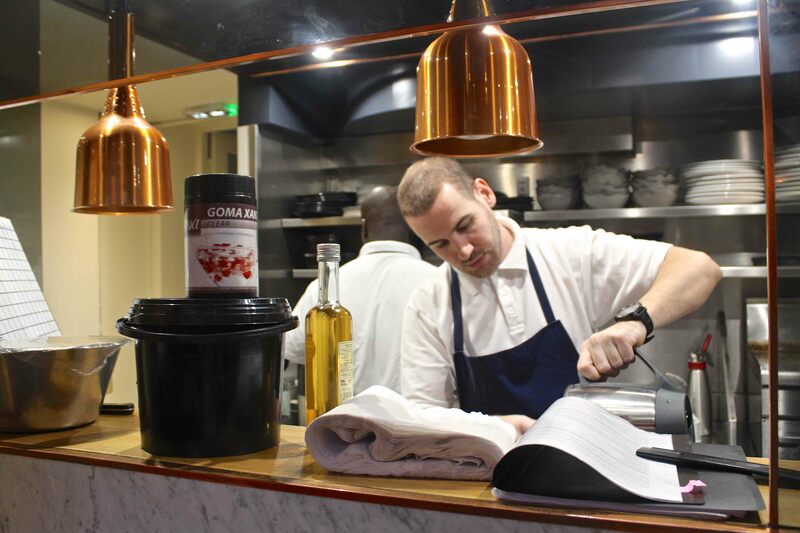 The food looks very beautiful & the dishes sound well balanced.